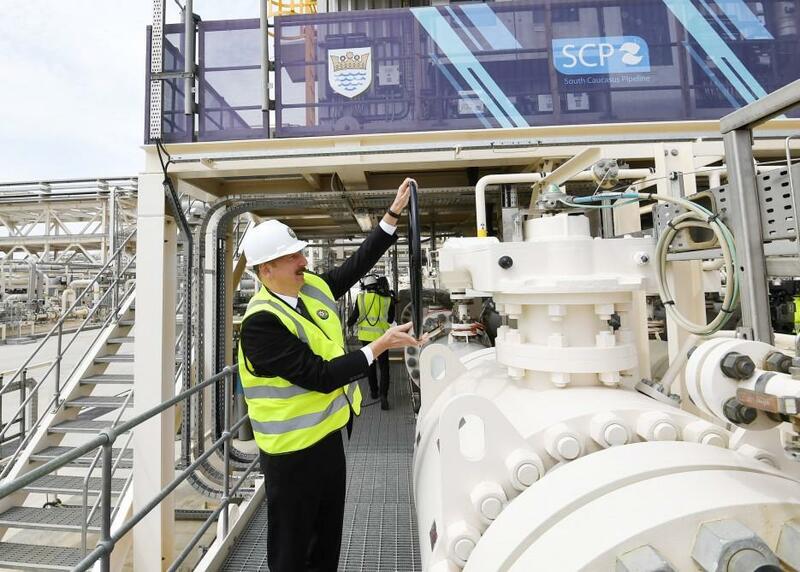 Azerbaijani President Ilham Aliyev took part in the official opening ceremony of the first phase of the Southern Gas Corridor in the Sangachal terminal in Baku May 29. President Aliyev delivered speech at the ceremony. US Deputy Assistant Secretary of State for Energy Diplomacy Sandra Oudkirk delivered a speech at the opening ceremony. The UK Prime Minister's Trade Envoy to Azerbaijan Baroness Emma Nicholson read out Prime Minister of the United Kingdom of Great Britain and Northern Ireland Theresa May’s message to the participants of the event. Turkey’s ambassador to Azerbaijan Erkan Ozoral read out Turkish President Recep Tayyip Erdogan’s message. Then OPEC Secretary General Mohammad Barkindo, Secretary General of the Gas Exporting Countries Forum Yury Sentyurin and BP Group Upstream CEO Bernard Looney delivered speeches. Later, the video footage about Shah Deniz Stage 2 / Southern Gas Corridor projects prepared by BP was demonstrated. In conclusion, President Aliyev pressed a button symbolizing the launch of the Southern Gas Corridor. The 25th Anniversary International Caspian Oil & Gas Exhibition has opened as well. The ceremony was broadcast live in the Baku Expo Center, where the exhibition is being held.